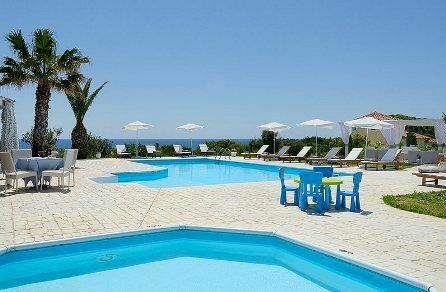 This fabulous little cluster of 11 villas, each with private pool, boasts a beautiful setting on Zakynthos' lovely Vassilikos peninsula, an excellent crèche, staffed by qualified British nannies, and a beach, named one of the best in Europe by The Sunday Times, within 5-10minutes walk - What more could a parent seeking sunshine and relaxation ask for? Pack some books, swimwear and a kaftan and prepare to come home a new person! In addition to their private pools, the villas share a larger communal one with separate children's area (depth 0.6m), beautiful coastal views, cushioned sunbeds and a snack bar serving drinks, ice creams and a decent range of light meals and snacks from breakfast until dinner. 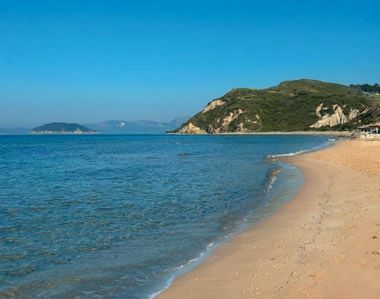 The beautiful beach at Gerakas is only 10 minutes away but there are steps down from the pool area to tiny shingle cove for swimming (bring plastic shoes as access is tricky especially for tots). 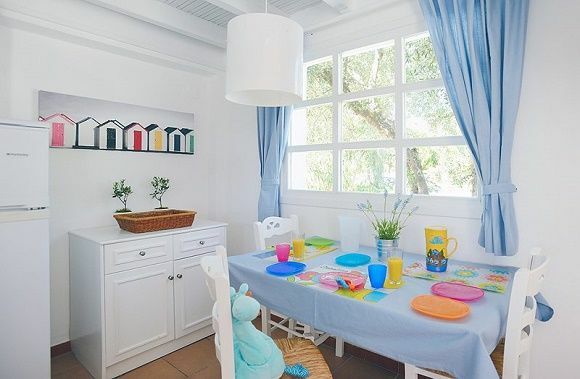 The excellent crèche is located near the shared pool (far enough to be out of earshot) and has its own shaded terrace and secure outdoor area. 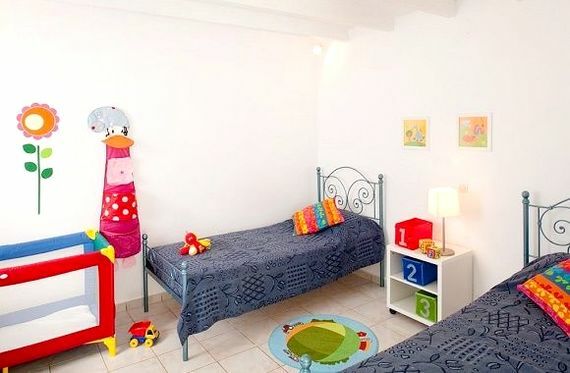 Facilities are bright, airy with child friendly furniture and a good range of toys and books, which are mainly new each season. Babies have their own room at the clubhouse with plenty of sensory toys, books and a separate nursery room so they can sleep if needed. 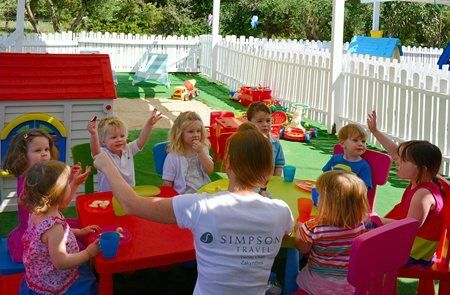 The nannies make the most of the beautiful gardens with nature trails, scavenger hunts and outdoor games. 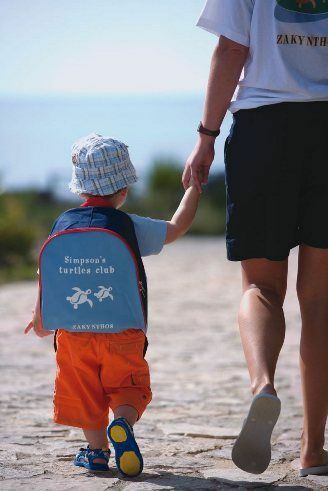 Generally, even the most reluctant newbie is raring to go to crèche after a session or two. The two bedroom garden view villas are best suited to families of 2-4 plus an infant. The accommodation consists of a comfortable and air conditioned, open plan kitchen/dining and living area with full cooker, fridge freezer, microwave, TV (for DVD use only) and CD/DVD player. 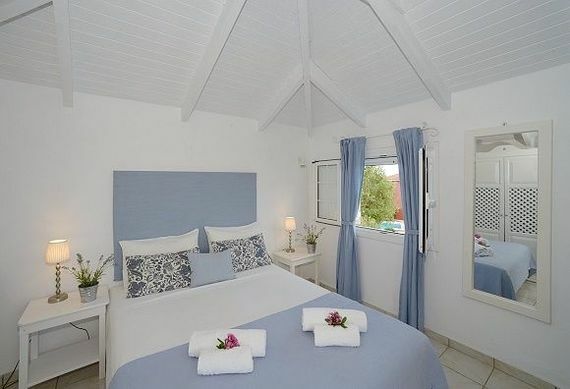 There are two bedrooms, a double bedroom and a twin bedroom. Depending on the exact villa available the villas are either on a single level or spread over two floors. One of the bedrooms is always air conditioned. There is usually family bathroom with bath. Outside there is a private terrace with BBQ and a small, gated swimming pool. Important Please Note: These prices are based on 2 adults, 1 child and an infant. An additional infant can be selected from the options and extras section when booking. 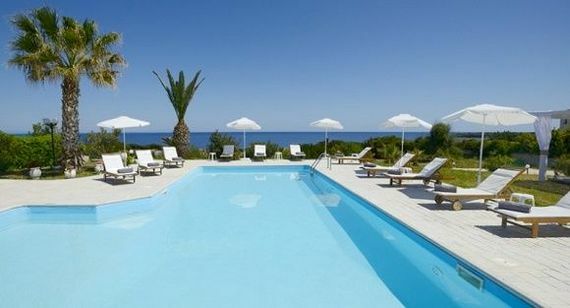 Rates include flights and car hire. For this reason prices are subject to change, any price fluctuations will be sent through to clients on confirmation of their reservation request, prior to any payment being taken. If you are a party of 2 adults and a baby or 2 adults and 2 children please use the 'live chat' function on the website or email help@babyfriendlyboltholes.co.uk for an amended price quote. 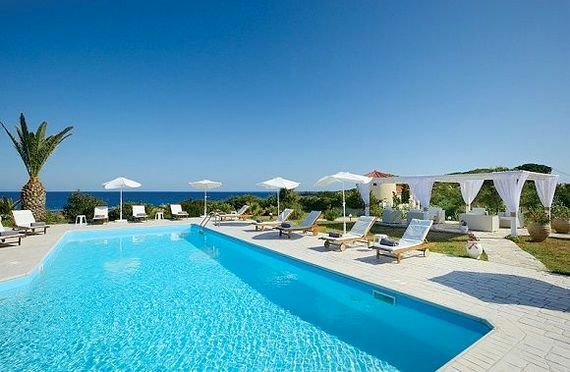 Zakynthos has been much maligned in recent years thanks to the hoards who flock to its Club 18-30 Mecca at Laganas but apart from the poor specimens you'll see nursing the mother of all hangovers at the airport on your return flight, you'd never know it was there from your pretty little villa nestled in a conservation area. 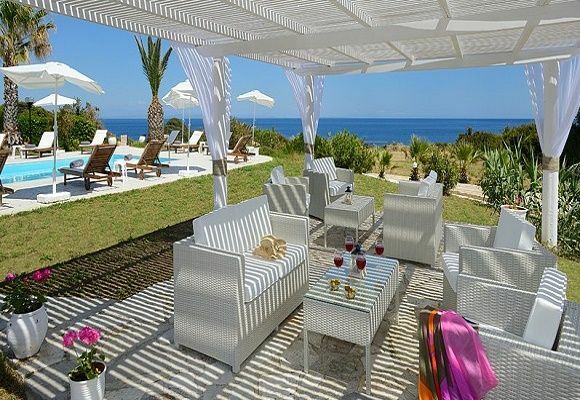 Peace and tranquillity rule the day at Periyali, yet only a short walk away is the famous beach Gerakas, named by The Sunday Times as one of the 12 'Top Beaches of Europe' and the breeding place of the Loggerhead turtles. With its stunning expanse of sand and shallow waters, it is ideal for children. The turtles are well looked after with roped off VIP zones just for them and educational signs dotted along the beach. Take out a pedalo and you may well catch a glimpse of Nemo's helpful mates (surely I'm not the only parent who's been forced ot watch Disney's Finding Nemo three times a week since junior turned 2?). If the 10minute walk there is all too much for little feet, you can always stop-off midway at the local taverna, which does a mean iced coffee and is generally well stocked with enticing ice creams. Plus, there's also the pretty communal pool with its snack bar offering drinks, ice creams and a good quality, if not hugely comprehensive, range of light meals and snacks, served all day and evening. 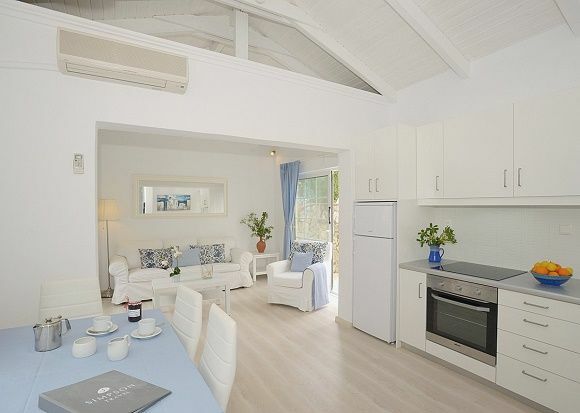 For self-catering, there's a well-stocked mini-market within 10minutes walk and larger supermarkets in the island's capital, which is approx. 25mins drive away. 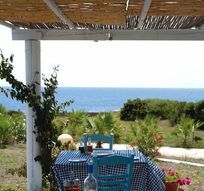 Nearby Porto Roma has tavernas, a further beach and is an excellent place to take a boat trip along the coast. 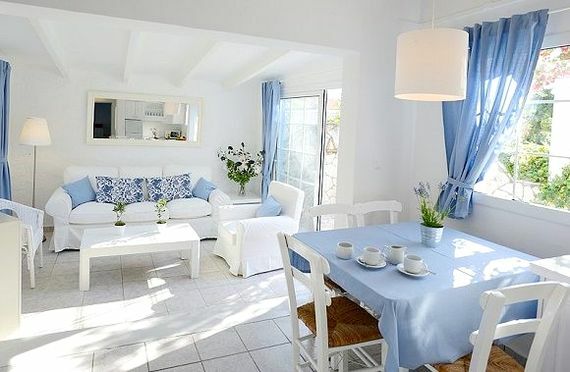 The splendid Venetian-influenced architecture, pretty town square and numerous shops, tavernas and cafes of Zakynthos town are just 25 minutes drive away. The villa sleeps 4 + infants in 2 bedrooms; a double and a twin. The prices are based on 2 adults, a child an an infant. 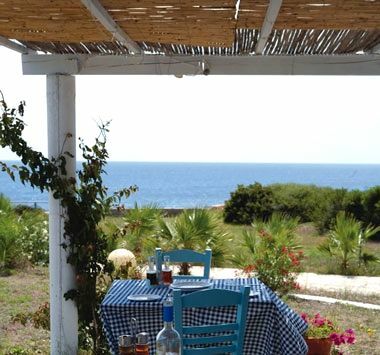 There are tavernas and a mini market just a short walk away. Complimentary infant pack available includes: cot (linen not provided), highchair, plastic bib, bottle warmer, bottle sterilizer, baby bath, changing mat, hand-held liquidiser. Additional items available on request include stair gates (where applicable),child toilet step, child toilet seat, potty, electrical socket guards, child locks to cupboards/fridge, childrens cutlery/plates/dishes. Bed guards are available on request but do cost £10pw. Infant or child booster car seats cost an extra £14, regardless of the length of stay (remember to specify child's age & weight). Alongside the creche, there is a new unsupervised play area with table tennis and other games to keep the children occupied even out of club hours. 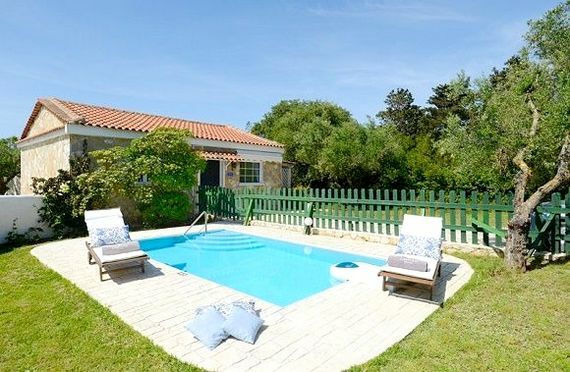 The villa has a private terrace with BBQ and a private pool. WiFi is available at the snack bar and pool area. We have just returned from a 2 week stay at Periyali Villas 10- 24 May 2009 and had the most fabulous holiday with two children (3 and 1 years old). It was the perfect mix for us of childcare (we had half days) and time with the children. First really relaxing holiday we have had with children. 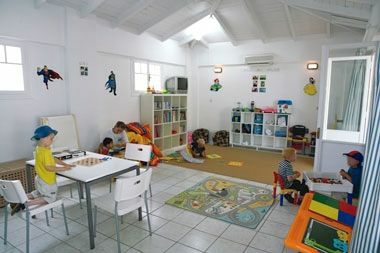 Accomodation and childcare facilities very good. Very peaceful location and beaches beautiful. 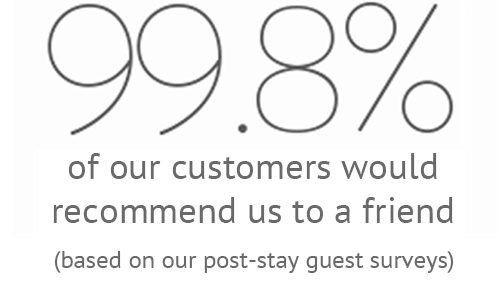 Only thing that could be improved would be softer pillows on beds, and better mattress in childs cot - we were very glad we took our own coolmax travel cot mattress. Highly recommend.